Mort, like many teenagers, is gangly, unpromising, and struggling with a menial job - in his case, as Death's apprentice. He can barely handle his simple task of ushering souls out of Discworld, but he really screws up when he meets the beautiful Princess Keli, who is scheduled to be assassinated. Going against his boss's wishes, Mort kills Keli's assassin instead, which angers and interferes with Fate. But Mort's heroism seems to be for naught, since Discworld proceeds as though Keli had been killed, while Death has too much fun drinking and gambling to be any help. This is the fourth book in the Discworld series. Terry Pratchett has written another great book. And as one of Nigel Planer's early narrations, it is good. But the quality of the recording is very poor. The sound is grainy and muffled and it changes between chapters forcing me to adjust the volume several times during the book. There are also several skips and repeated sections. I would still recommend the book for the story but be aware that the quality is not the best. The story is fantastic, and the manner in which it was read was great. I've listened to lots of books and this is one of the best and most fittingly read books. Very glad I purchased it. Enjoyable story, very well narrated. Always enough happening to keep you wanting more. THE PROSE!!!! A must read if you love strong characters, humour and sprinkles of dense yet whimsical philosophical ideas this is where you should turn. Great story! I love Terry Pratchett, and I love the different voices Nigel does for each character! 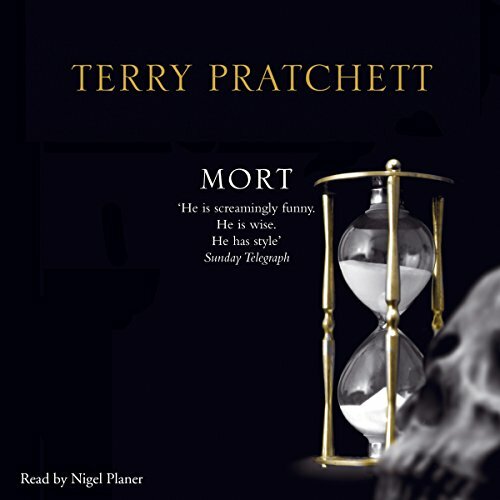 Nigel Planer isn't my favourite Terry Pratchett reader - I think Stephen Briggs does the best job of interpreting Discworld's regular cast of characters - but he's pretty good, and the story here is kind of interesting, if you're the sort of person who likes to think about what happens to you after you die. And for some reason I found the whole concept of 'Mort' (I had never realized that 'Mort' is both a nerdy-sounding first name and a term for death, which is decidedly not nerdy-sounding) very clever and amusing. Worth getting if you're a Discworld or Terry Pratchett fan. However the audio quality is quite hairy, like a caveman out for dinner at a Michelin star restaurant before the invention of scissors. Nigel is a very good narrator for these books and does a fantastic job in this one. Easily understood and with great inflection. Excellent book, extremely well read!! I could not reccommend it any higher. I am so impressed with the character voices. the writing is of course genius! A great intro into the discworld and its concept of death. note amazon requires 15 words in a review so I'm writing this filler. Another wonderfully hilarious and smart book by Terry Pratchett. This going up as one of my favourite fantasy novels of all time. the book itself is funny and keeps you listening. Although the narration is quite good, the recording quality is quite bad and inconsistent, especially when changing from one chapter to the other. Terry Pratchett is undoubtedly one of the most brilliant minds. He never fails to bring out a laugh, always encourages the reader (or listener) to think, and provides us with a colourful outlook on life and literature. He is sorely missed. 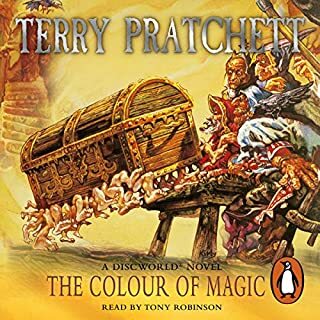 I really enjoyed my first discworld story. Unfortunately the audio quality varies from chapter to chapter and is lacking in some. I've always loved this story about DEATHS apprentice, but the sound quality of this recording isn't great. Another beautifully written book by Terry Pratchett. Not a bad performance by Nigel Planer (although I didn't enjoy it as much as the earlier books). Unfortunately the quality of the recording was mixed - all OK, but varying between chapters; not what you expect from a professional recording. If you could sum up Mort in three words, what would they be? What disappointed you about Mort? 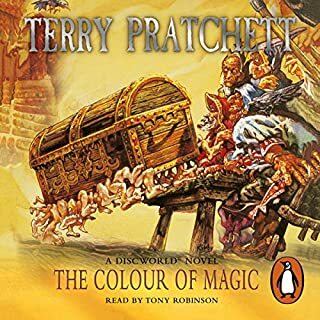 This is a great story by Terry Pratchett, ably narrated by Nigel Planer but sounds as though it is coming from the bottom of a felt lined pit. I listen to my books whist driving, and, with the lack of clarity in this recording, it is honestly almost too difficult to listen to. "THERE"S NO JUSTICE. THERE'S JUST ME!" Where does Mort rank among all the audiobooks you’ve listened to so far? Mort as a book would certainly fail somewhere in my top 15 books of all time. 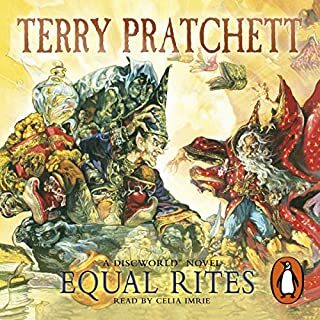 The audiobook is overall excellent at maintaining the charm and comedy inherent in Pratchett's wordplay. Sadly the recording sounds muffled in places as though it was lifted from an old cassette recording so those who are hard of hearing may have some difficulties. What other book might you compare Mort to, and why? I believe the only thing you can compare Pratchett to is more of the same so I would compare this book to Reaper Man as it shares the same sense of humor and also makes Death the main character. Planer is an excellent narrator for characters like Death with a rather dry and sometimes unintentional sense of humour so I would say Death is his best character. On the other hand he can occasionally struggle to make Yssabelle and the princess sound convincing as his voice can sound too deep for them sometimes. What made the experience of listening to Mort the most enjoyable? A great mixture of superb writing and great narrative bought to life a great story that humorously throws new light on what a silly notion it is to fear ones own sorry demise. The way that Nigel Planer manages to bring to life all the characters in the book. I felt his portrayal of DEATH'S daughter was very funny. It's nothing personal, it's his duty! Would you listen to Mort again? Why? I am going to listen to mort over and over again. Terry Pratchett is an amazing author. Death is my favourite character because of his cluelessness but his understanding of how the world works. What about Nigel Planer’s performance did you like? His voice was clear and put meaning into the words. The book was amazing and I don't have a favourite bit. It's hard to keep reviewing Terry Pratchett's work because the same compliments apply again and again! He really was one of the greatest writers of our age. In the first couple of books of the series the style that runs through the entire series is still settling down and being perfected - so I'd recommend that anyone new to Discworld starts later in the series and comes back to the earliest books later - once they've fallen in love with it. 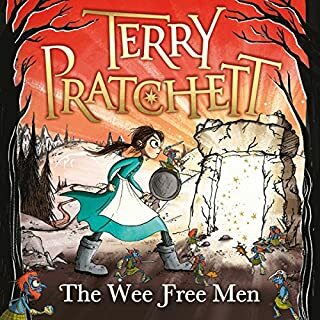 This book, is where we really see the style of writing that makes Terry Pratchett a force to recon with, and a truly great author. A brilliant story. Wonderful characters - clearly a great imagination is at work here, and woven through the whole thing is humour, wit, satire, a astute observation of the human condition, and a passion for ridiculing pomposity and stupidity. Yes. The book is well written with very well developed characters. The voices by Nigel Planer enhance the characters even further.